Imagine New Mexico as a community with 33 different neighborhoods. Then imagine yourself as a business leader looking to locate your company in one of those neighborhoods. As you consider what qualities each locality offers your firm—and your employees, many of whom have families and children—you may be surprised to discover that in 16 of these neighborhoods as many as half of the children live in poverty, roughly half of the families are headed by single parents, and half of the residents have limited access to healthy foods. On top of that, many of these neighborhoods have high housing costs, high rates of adults without health insurance, and low levels of education. If you’re looking for a positive, healthy environment for your company and your employees—one with low health costs, good public infrastructure, an educated workforce, and high-quality child care and schools—some of these neighborhoods will have a hard time competing for your business. Why are these data sites needed? Where we live, work, play, learn, and interact with others influences our overall health and well-being. These factors also greatly impact how successful our children will be in school. Early environmental, social, economic, and health factors—positive and negative—help shape the rest of a child’s life. Safe communities with ready access to high-quality prenatal and early child care services, schools, health care facilities, libraries, and playgrounds, as well as those offering solid career opportunities, good air quality, and low levels of poverty, are supportive environments in which to raise healthy children with hopes for a solid future. While the CHR allows us to compare counties to each other on key indicators, this isn’t the most important aspect of these data. Rather, the data can be used by community members and leaders to highlight either community assets to brag about or shortcomings to be dealt with. When the barriers to family health and well-being are identified, community members can work together to find constructive solutions that will improve the quality of life for everyone. Diverse communities across the country are making progress in connecting these data to action. For example, residents have rallied in a neighborhood in Detroit with high crime and poverty and few healthy food outlets. Residents began youth mentoring and community garden programs, are restoring vacant properties to attract new business, and are helping families prevent foreclosure. To improve the health of neighborhoods in Columbia, MO, a local coalition is advocating policy change to improve the public transit system, a key factor in helping low-income workers get to their job, doctor, or the grocery store. The County Health Rankings is also linked to another program, the County Health Roadmaps, funded by the Robert Wood Johnson Foundation, which helps communities mobilize and take action to create healthier places. 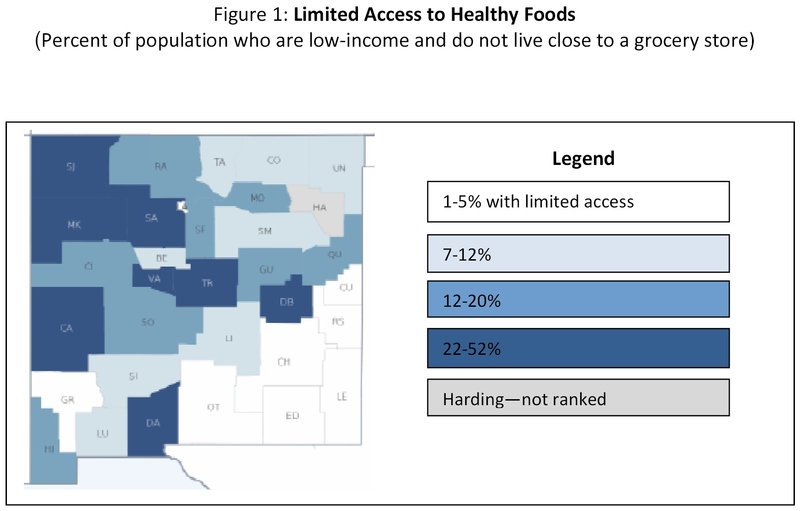 In New Mexico, the Connecting Data to Action program (a Roadmaps to Health project) works with communities throughout the state to help them advocate for policies that will create, fund, and sustain a high-quality, universally accessible continuum of early childhood care, health, and education services. Such policies will enable all children in the state to have equal opportunities to be prepared and ready for school, and as such, for long-term academic, health, and economic success and well-being. For more web-based data, see the KIDS COUNT Data Center (http://datacenter.kidscount.org/nm) and the NM Community Data Collaborative Public Maps Gallery (http://berncohealthcouncil.org/public-maps-gallery/index.html). Chris Hollis oversees Connecting Data to Action and New Mexico KIDS COUNT—both programs of New Mexico Voices for Children.